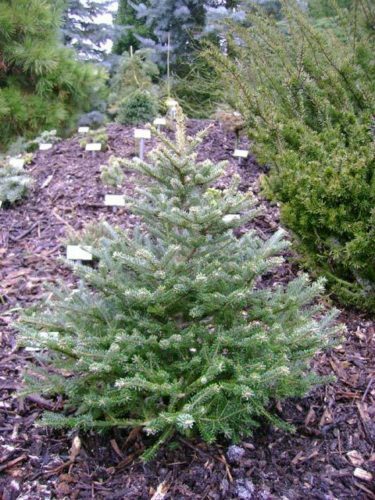 Abies fraseri 'Rawl's Dwarf' is a broad, upright dwarf selection of Fraser fir. Needles are shiny and dark-green. Typical rate of growth in most areas is 1 to 2 inches (2.5 - 5 cm) per year, resulting in a small tree, less then 2 feet (60 cm) tall after 10 years in the landscape. Young plants will be quite amorphous until eventually developing apical dominance and start growing upward becoming lush, squatty and cone-shaped. There is quite a bit of confusion regarding the correct name and history of this cultivar. One can find the original plant at Bill Walter Conifer Collection at the Dubuque Arboretum, Iowa, USA. 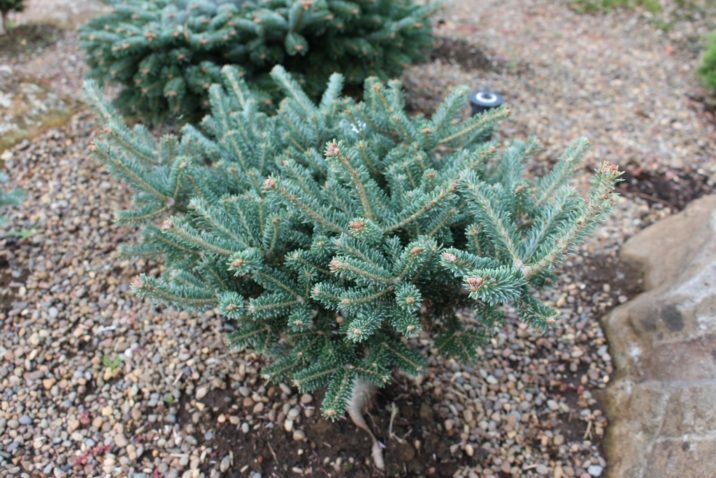 In a recent conversation with the curator of the collection, he stated that the original plant came into the collection with the name, 'Rawl's Dwarf.' The orginal plant is now 20 years old (as of 2014) and measures 3 feet tall and wide (90 x 90 cm). Beyond that, no other history is available at this time. Synonyms such as 'Rawles', 'Rawles W.B. ', 'Rawls' and several other permutations exist in the nursery trade. 'Raul's Dwarf' is the name registered with the Royal Horticultural Society, but this is also incorrect. Abies fraseri 'Rawl's Dwarf' at the Edwin Smits pinetum in Volkel, The Netherlands. 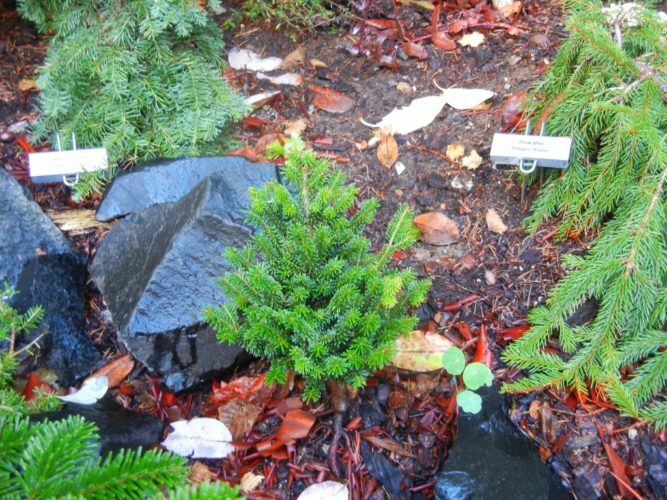 Abies fraseri 'Rawl's Dwarf' -- a nicely formed young plant at Hobbiton Gardens, Port Orchard, WA. Abies fraseri 'Rawl's Dwarf' — an attractive, symmetrical young plant at the ACS Reference Garden, Oregon Garden, USA.